Favored by local Alaskans for their wonderful flavor, size and creamy texture. Direct from the pure, icy cold waters of the Gulf of Alaska. We catch these wonderful shrimp in small pots in deep water during the cold of winter. 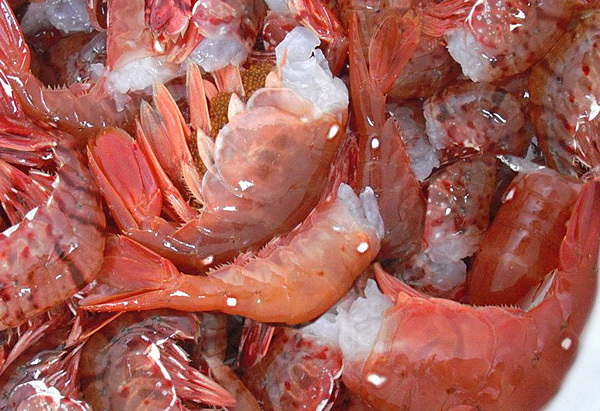 These are the cleanest, purest shrimp in the world - no back vein to remove. Colossal Spot Prawns carry eggs, which are considered a delicacy - enjoy them or you can just rinse them off. To thaw: just place them in your refrigerator overnight or run under cold water. To cook: place them in a pot of gently boiling water, after one minute remove from heat and let soak for 10 minutes. Enjoy the best treat Alaska has to offer. These are rare and seasonal... you won't see them in stores. 2 lb. Ocean Run Box will contain mixture of sizes. Could range from U12 to 21/30Ct. Each box will be a MIXTURE of sizes..